Last week I published a post on how to create a chart on the security roles for a list of users. It was one of those posts where I wasn’t really sure in advance if I was the only one who would find it useful. Hence, I was very happy about all the positive feedback I got on social media from it. So THANK YOU very much to everyone who liked the article, tweeted, commented, etc. If you haven’t seen that post yet, check it out here. 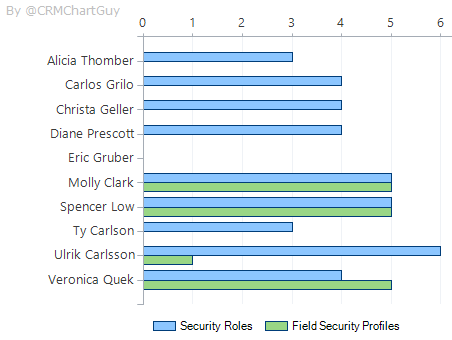 Charts on Security Roles in Dynamics 365. The chart has already helped me out a few occasions where I just needed that quick overview of who has got what role assigned. That of course got me thinking. 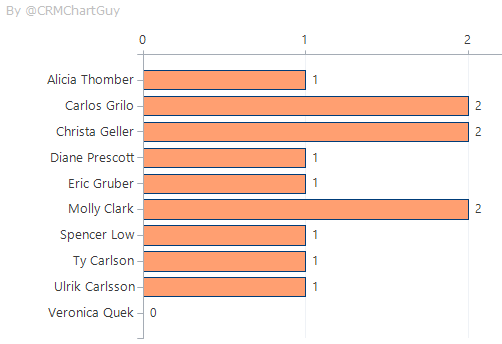 What else can we do with charts based on the user entity? My first thought was Field Security Roles. There’s a good chance you are working with field security roles too, so I added that to one of the charts. Now I can quickly see if someone has roles of either type assigned or not. Since the role assignments of the security and field security roles often go in tandem between users, it is easy to spot outliers that may not have all the roles they need. The fetchxml was a little more tricky for this chart, so here it is. Note that there’s now two link-entity sections. One that counts all the Security Roles through the hidden intersect table, and one for counting all the Field Security Roles in a similar manner. Also, the property distinct=”true” was added to the aggregate as we otherwise would get incorrect counts due to the two sets of linked-entity sections. But wait, there’s more. What about teams? Teams follow the exact same process as for the security role chart. Just links to the team entity instead. The chart also filters the team data to exclude the default business unit teams. I’ve added these charts to the same download site as the Security Role charts. Link is the bottom of this post. The XML and the filenames have also been updated a little so they can be imported via the Advanced Chart Editor tool in one go. Once you have downloaded all the chart XML files from the link, click on “Import charts” and select “From Folder” in the editor. Select the folder where you saved the charts in the next dialog box. Once you click the OK button all the chart files in the folder will be analyzed and imported to Dynamics 365 as user charts. No need to pick the specific entity or anything. This feature is a part of the original chart manager that the Advanced Chart Editor is created on top of. So full credit to Mr. XrmToolBox, Tanguy Touzard for that awesome feature. The reason all the charts import as user charts, is because the filenames all end in “_personal.xml“. If you wanted to upload them as system charts, just remove that part of the file name. Just do not import a set of each in the same organization. The charts already have GUIDs. Then you would have two charts with the same GUID. Not sure why Dynamics 365 allow you to do this. If you want to do both, you’ll have to open the XML files, delete the GUID and import the charts manually. 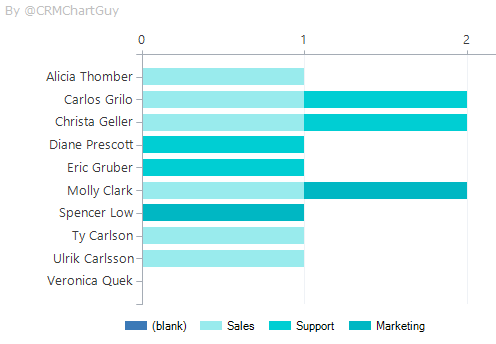 is it possible in d365, a chart on dashboard and on click of particular bar of chart, a grid shows data for that bar? Hi Ashay. No, as mentioned in the post, the drilldown capability disappears when you do some of these customizations. Do you tried to build a chart to count list of members per Team by listing each team.